shunning specific food. Is added sugar really bad? really better than their white counterparts? Well, let’s tackle this issue today! some protein and B vitamins. more than 4g of protein and the carbohydrate levels are almost similar. shouldn’t really pose much of a problem. So what so bad about brown rice, or white rice, or grains in general? Why is it that most health advocates shun them? 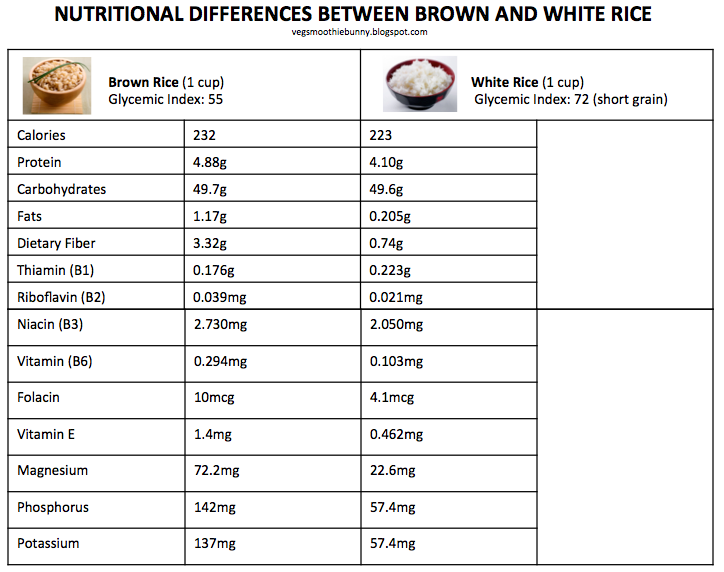 Well, people generally eat very low fibre diets (see blog post on what singaporeans are eating daily) so swapping brown rice for white has added benefits in that it is a better alternative that white with it’s extra fibre and vitamins/ minerals. SO by swapping, you get an extra 2+g of fibre, 50mg more of magnesium, 60mg more of potassium etc. But if you are eating a diet of white rice TOGETHER with healthy vegetables etc that meet your daily fibre and mineral needs, then it’s not a matter of DEATH that you switch to brown. Conversely, if you are swapping white for brown and eating brown rice with a piece of fried chicken only, sure, it’s healthier because there is that little bit more of fibre and minerals but switching to brown is not going to MAGICALLY make you healthier or give you all the nutrients you need. There are also some people who cannot tolerate brown rice as the unrefined grain irritates their gut lining. It really depends on the individual. Personally, brown rice works for me because the added fibre helps steady my blood sugar levels because I don’t always have access to veg/ other fibre sources all the time. Whereas white rice is so soft and easy to eat that it’s really easy to overeat. It sends my ratios out of whack and my super sensitive blood sugar level will cause me to crave and want to stuff my face. A friend of mine, however, cannot tolerate brown rice at all as it irritates her gut and makes her feel thoroughly bloated and miserable. This makes her want to eat (other unhealthy things) to soothe the tummy pains and she feels better off eating white rice. At the end of the day, just take a look at the Japanese. They eat lots of white rice but paired with healthy side dishes at every meal. It’s really up to the individual and what works best for you. White or brown, you need to look at what ELSE you are eating besides the rice that really makes the difference. *Please read disclaimer. I do not claim to be a professional of any sort. Hi, I love reading your blog!! Thank you so much for the helpful information~ I would like to try eating brown rice, do you have any brand of brown rice to recommend? Thank you! Browsing through, your blog has alot of good posts. You're spot on regarding the white vs brown rice issue. I too have started questioning the comparison. The "effect" of combining vegetables or other foods with a carbohydrate source is called Glycemic Load. The Glycemic Index is just a guide on 100g of carbohydrates of a certain food like white rice, brown rice etc as compared to glucose the gold standard. More importantly is the Glycemic Load, where the actual quantity consumed AND its Glycemic Load is taken into consideration. As you've mentioned, we don't eat just white rice alone and we also hardly eat 100g of carbohydrate (macronutrient not physical weight) at one go. With the Glycemic Load, portion control and moderation shows how important it is. Because consuming more of a Low GI food, will increase the load compared to consuming a lesser amount of a High GI food. But of course for the same amount of carbohydrates, Low GI is a healthier alternative at least for general meals with no specific dietary requirements. The emphasis on nutrition should be on balanced, portion, and healthier choices. However for public health, where sadly people are generally more educated and know what to do, it's the influence of popular culture, society and habits from young that are the big obstacles. Haha thanks for dropping by and for the great write up here! I should totally invite you to guest blog here! We could all benefit from your wealth of knowledge! It's unfortunate about the gestational diabetes but there are many ways to handle it. I don' tnow about the brown rice's actual GI count but brown rice in general has a GI count of 55-85 depending on how processed it is. To ease your fears, I would say that the GI value of the rice doesn't really matter much but it's what you pair with it that matters. Also, the hom mali is a real type of brown rice. Some brown rice have high GI because unethical suppliers actually colour their white rice darken to make it look healthy! The GI value of the food is based on that food BY ITSELF. So eating white rice alone will impact your sugar levels drastically because of it's high GI but this can be mitigated by pairing it with fibre rich food, protein or good fats such that it slows the impact on blood sugar levels. The Thai Hom Mali brown rice is one of my favorites in terms of flavour and I recommend that you enjoy it as well paired with lean protein and fibre rich sides! On a standard round dinner plate, 1/2 a section should be ALL leafy veg/ broccoli etc, 1/4 meat and 1/4 brown rice. If you can handle it, i personally recommend subbing the brown rice for steel cut oat porridge sometimes maybe for variety. What you want to always make sure is to have carbohydrates with fibre to slow the release which means hawker centre porridge is possibly the worst thing you can eat because of it's high sodium and fat content + high GI.